Niall Linehan has been working within the family business for the last number of years developing small and medium-sized projects. 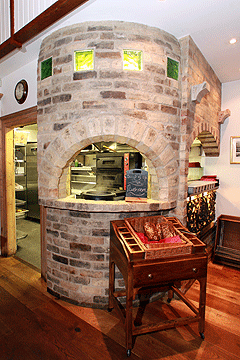 These projects range from one and two unit developments to quite complex projects such as restaurants. Niall Linehan Construction has a broad spectrum of completed projects from conservation work on period buildings to contemporary new builds. You will find that we can assist in all aspects of any project from pre-planning to the final finishing out, including furnishing and interior design. We incorporate salvaged materials into our designs where appropriate, which we source locally, and in Britain and on the continent. 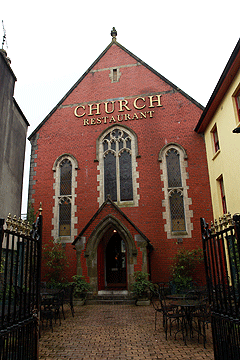 As an example, for one of our recent projects we sourced an 18th century staircase from an old French chateau in Lille, France, and then fitted it into ‘The Church Restaurant’ in Skibbereen. 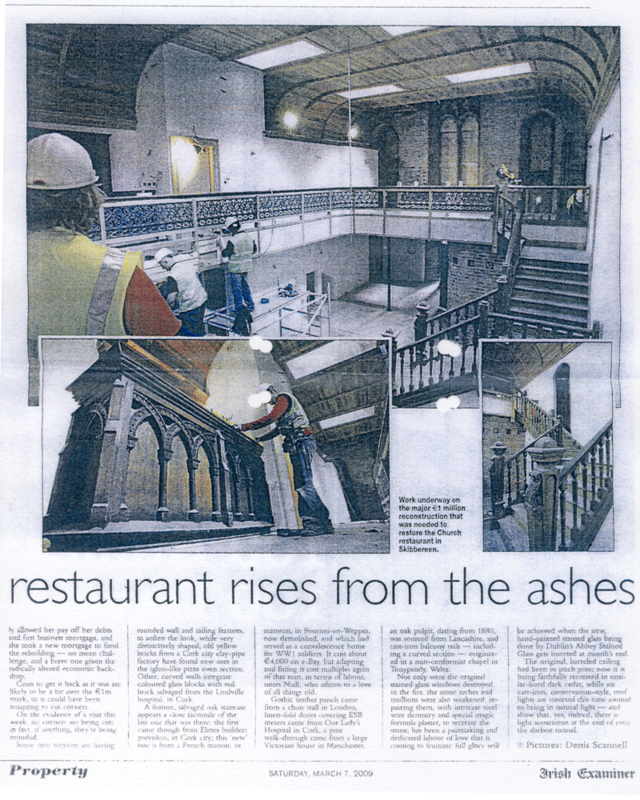 On that particular project we took the restaurant that had been gutted by fire, and guided it through the planning stage, then the reconstruction and finally right up to the small details like the cutlery on the table to the final re-opening. Using contemporary designs we marry them with period style to achieve modern, classic living spaces. Over the years we have gained a reputation for our quality of finish. This is largely due to the fact that we use cabinet-maker standards when finishing out a project, employing our own team of highly-skilled tradesmen. Conversion of former stables(1750) into two luxury town houses. Conversion of period building (1865) into 4 apartments. Newly built Georgian-style 2-story house. Conversion of 18th century building into two 1 bed apartments. Contemporary new build complete with geo-thermal heating, heat recovery ventilation and an air tightness specification. To ensure that you have a good experience we deal with the conservation officers, fire officers, health authorites, health and safety officers, planners, quantity surveyors and engineers to bring each project to a speedy and successful conclusion. People often assume that such a high standard finish means increased costs. This is not necessarily the case, and we can price the job to suit your budget! We offer a unique service in that we can take a project from design stage to completion doing all the work ourselves with no sub-contractors. Please call us to arrange an appointment to discuss your project. 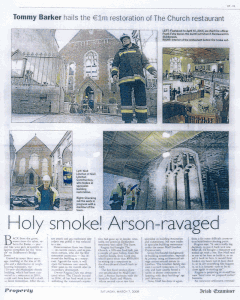 The following article about the restoration and conservation of The Church Restaurant in Skibereen, after it was burnt to the ground in a devastating arson attack, originally appeared in the ‘Southern Star’ newspaper. 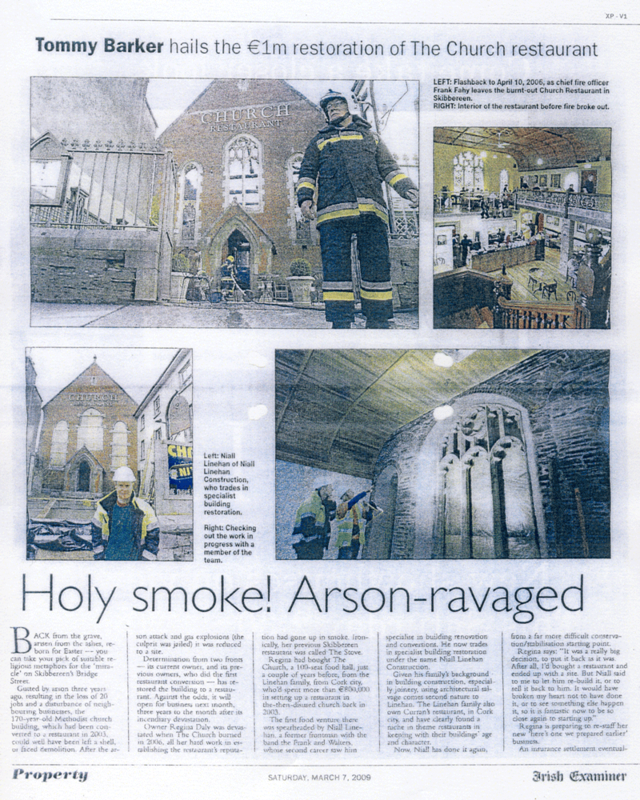 Everyone in Skibbereen was devastated when the famous landmark building was gutted by fire in an arson attack on April 9, 2006. A Moldovian man had opened four spare gas cylinders and set the building on fire. He was prosecuted and sent to jail for the offence. “We imported Portland stone to restore the surround around the large stained glass window at the back, and we also had to restore the mullions that had been cracked in the fire. “When it came to fitting out the building internally, we couldn’t use new stuff because it would stick out a mile, so we sourced the oak staircase from a mansion in Lille in France. But what is perhaps most impressive about the restoration work is the stained glass windows, the likes of which many people feared they would never see again. Niall said the work that Abbey Stained Glass of Dublin did in re-creating the windows from scratch – using the same stained glass method that was used six hundred years ago – was nothing short of amazing. Niall admits he is proud of the fact that this beautiful old building, with its geometric, simplistic shapes, has been given a new lease of life and will be there for future generations to admire.